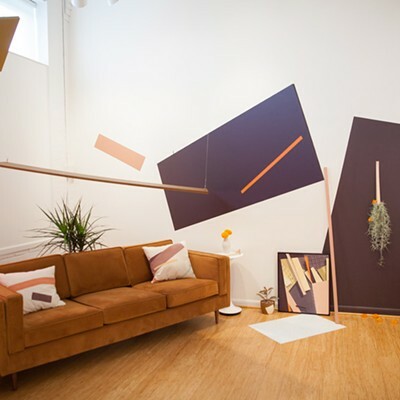 PHOTO BY HANNAH BETTS At Axom Gallery: installation view of one section of "Congruent," a collaborative series of staged living spaces by artist St. Monci and Hannah Betts of design studio Lives Styled. 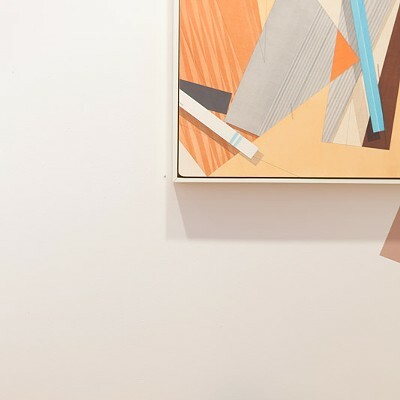 Tuesday through Saturday, 11 a.m. to 6 p.m.; Thursdays until 8 p.m.
Axom Gallery has been temporarily transformed from a white walls art gallery into a supremely fun, impossibly chic series of staged living and working spaces. A beloved local creative couple — painter St. Monci and Hannah Betts of design studio Lives Styled — have taken over the room, filling it with their art and carefully arranged furniture that is sold through Axom Objects. While it isn't uncommon to sell furniture by arranging the showroom into staged areas to give potential customers ideas (Robin Muto keeps the entry room of Axom fully stocked and staged year-round), it's a great idea to use the art as the starting point: match your couch to that painting you love, instead of the other way around. 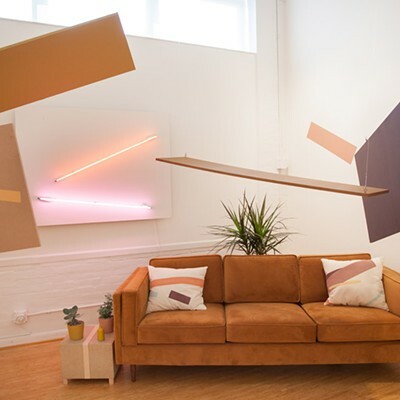 "Congruent" is a collaborative installation, and combines St. Monci's kinetic geometric paintings and the design sensibilities of both Monci and Betts. 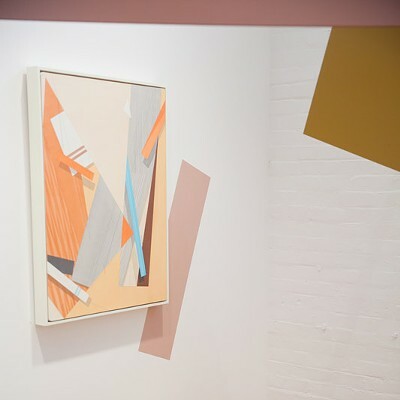 Monci's gouache, acrylic, and graphite paintings and Bett's digital photographic prints are joined by simple wood-mounted neon lights designed by Monci. Large planes of wood with simple painted rectangles are suspended at just-so angles from the ceiling, cleverly creating sectioned-off spaces around couches and chairs while maintaining a trendy openness to each space. Paint has been applied similarly to the walls themselves, echoing the shapes and hues in Monci's paintings and marking the borders of each living space. The idea for this show came to Muto a few months ago, when she was considering what to do for Axom's "Artful Living in the Summer" series, a recurring showcase of art and home goods. "It's the one time that we really try to blend the art and design," she says. "We always try to do things in the store in a very curated fashion, but we don't normally do that in the gallery." Aware of Monci and Betts' strong sense of design, she considered approaching them. Then Muto attended the Memorial Art Gallery's "Cocktails with Creatives" fundraising event, which included a group of artists showcasing their wares at tables. She says she learned that MAG Director Jonathan Binstock had wanted the artists to create more of an experience or an environment, instead of just showing their work. St. Monci had built sort of an arbor, Muto says, made of U-shaped metal pieces that went down the table. "And from this structure, he was hanging his actual paintings," she says. Impressed with the presentation, Muto asked Monci and Betts if they'd like to do a show in the gallery at Axom. The couple had already been thinking of finding an apartment to style, she says, so the timing was perfect for everyone. "I told them, if there are certain pieces you want me to order, to have in the show, I'll get them for you," Muto says. "Hannah really wanted the pink sofa." 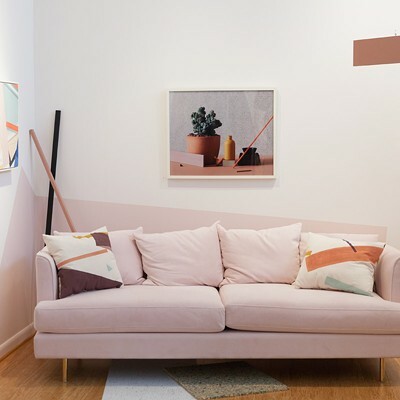 That plush, powder pink couch is in the first inviting section when you enter the gallery. Its blush hue is echoed onto the wall in paint, and picked up by pinks in two nearby Monci paintings. Unexpected materials accent the stagings in unique ways. 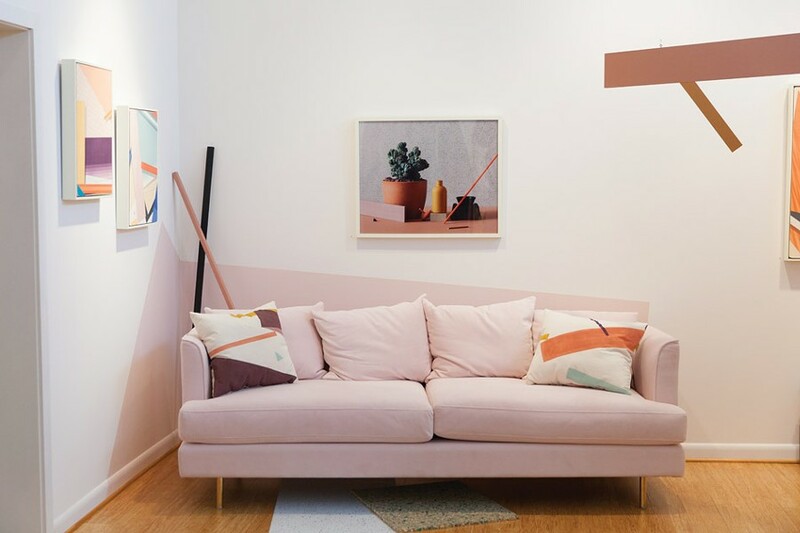 A rectangle of speckled vinyl and another of confetti-patterned foam — the kind that goes under carpets to make a more cushioned surface — poke from beneath the pink couch. Two long, wooden slats lean casually in the corner behind the couch. Bricks painted in the same pastel and warm earthy palette are lined up on the floor nearby. 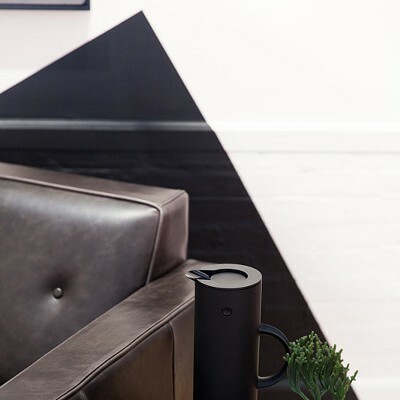 A luxurious black leather arm chair becomes a throne in a surreal realm, surrounded by the sharp angles of floating wood and a sculptural end table. These shapes and tones echo Monci's paintings that they're paired with. 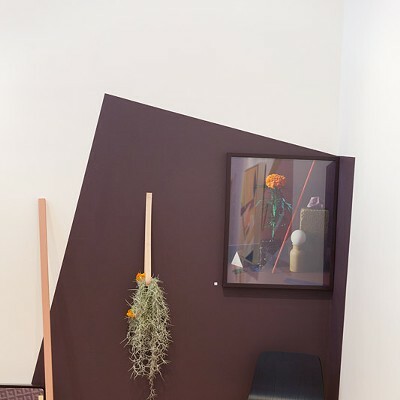 And Betts' photographs read like miniature, tabletop versions of the staged spaces, featuring plants and sculpture and pieces of bright wood arranged at careful angles. 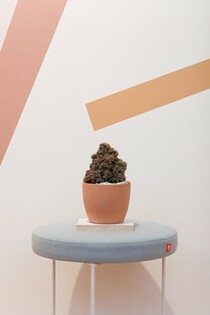 In a far corner, the staging consists of a paint-darkened wall; a simple, thin-legged stool; and a photo by Betts and painting by Monci; elements of each echo in the environment — a looped leather strap tacked to the wall cradles a bit of Spanish moss, a bright orange blossom in the photo is picked up on a shard of color in Monci's nearby painting and on the wall as well. The balance of everything reads as effortlessly minimalist while color accents and angled forms provide a sense of movement and life. It's pared down without getting stale. Muto reviewed the brochures and fabric swatches with Monci and Betts about two months before the show. "Both of them were very keen on the vision for the show," she says. "They have similar sensibilities when it comes to color." And there are lots and lots of succulents, which have become the necessary accessory for an Instagram-worthy room. Everything is for sale, from the paintings and photos to the furniture and the plants. Two of the accent pillows that Monci made sold to a visitor from Brooklyn who works in the financial district, Muto says. The show is an effective method of spotlighting artistic talent while providing a vision of how investment pieces of furniture look within spaces. Muto says she's interested in working with other artists in a similar fashion in the future.